Today’s agenda in Haiti was dedicated to evaluating and planning for the future of our One Hen program. One Hen, Inc. was established in 2009 as an outgrowth of the 2008 children’s book One Hen: How One Small Loan Made a Big Difference. The story is of a poor boy from Ghana who purchased one hen and, through hard work and determination, eventually became the largest chicken farmer in the country. 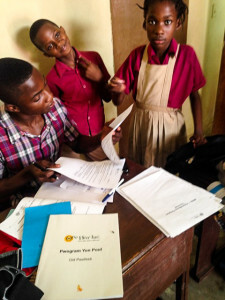 One Hen developed a classroom curriculum around this success story, empowering children to become social entrepreneurs by instilling within them four values: financial responsibility, personal initiative, global awareness and giving back. The One Hen program has enormous potential for the children of Haiti. With an unemployment rate of over 40%, few children graduate secondary school with any job opportunities. Even fewer go on to college to learn an employable skill or trade. The One Hen curriculum, however, equips children with the business and entrepreneurial skills needed to build their own successful, sustainable businesses, while also encouraging charitable giving of their profits to others who are in need. In late 2015, we entered into a partnership with One Hen and began a huge undertaking – to translate the entire curriculum into Haitian Creole. From April to June of 2016, we then completed a successful pilot project- of the now “Yon Poul” program- with a select 9 teachers and 90 students at the Bethlehem school in Cap Haïtien. And now, after much discussion, we’ve decided to expand the One Hen program to the Marmalade school, the Institution Mixte Martin Luther de platon school, with the commitment to train 9 new teachers that will instruct an additional 90 students! Today we’ve established a November 7 start date for this year’s programs in Marmalade and Cap Haïtien. The 180 participating students at both schools will complete an eight-month enrichment program where they will learn financial literacy, business skills and compassionate giving. The students will also be given a small loan to build their own small businesses, and an opportunity to sell their business products in the local community. Profits will support a local charity, fund the 2017 program and reward the children for their work with a gift or party. We are incredibly excited at the prospect of the One Hen program. If we can instill sustainable business practices and entrepreneurial skills into the youth here in Haiti, we will take a giant leap in our mission to educate and employ Haiti’s next generation of business leaders. Check back later this week for a post detailing the products that our pilot project students created, and where they decided to donate their profits. For real time updates, follow our Instagram (@HelpforHaitiUSA) and Facebook, too! Praying for the blessing of Jesus upon your team.